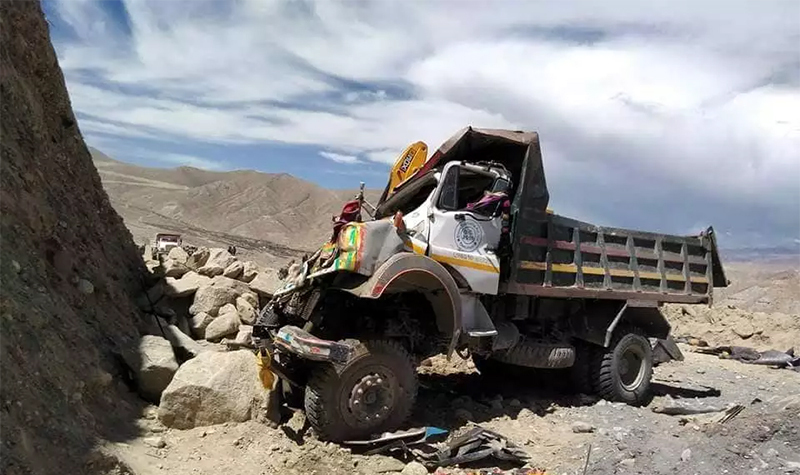 Mustang : A total of 15 workers died when a tipper met with an accident at Syangboche of Lo Ghekar Damodarkunda rural municipality of Mustang district today. According to Chief District Officer of Mustang, Shishir Poudel, the accident took place when the tipper carrying workers of Beni-Korela road section met with an accident. He said, "Fifteen persons have been confirmed dead in the accident. All the details of the accident are awaited." Similarly, 17 other workers were also injured in the accident. Police personnel deployed from Ghani and locals have been carrying out rescue operation. The incident site lies 50 kilometers away from the district headquarter, Jomsom. Deputy Superintendent of Police of Mustang, Mahendra Khadka, police personnel from Jomsom have also been headed towards the incident site. He said, "A helicopter has been sent from Kathmandu for the rescue of the injured."